MAKE THE WORLD GO ORANGE!!!! 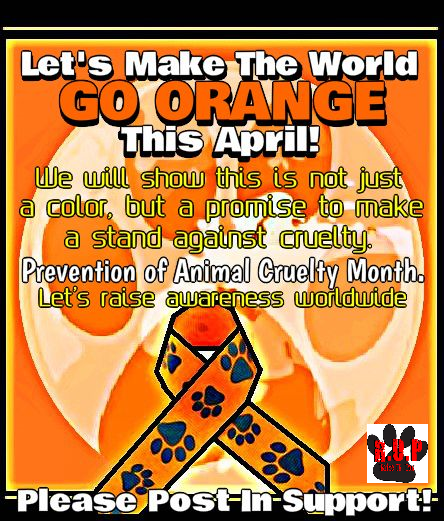 We at Raise Ur Paw, a Not-For-Profit Incorporation, are hoping that individuals around the world will take a moment of their time this April 2015 to wear orange strong and proud for Prevention of Animal Cruelty Month.. to show that this is more than just a color but a promise to stand up and speak out against the cruelty that our innocent voiceless endure and are subjected to on a daily basis, and raise awareness on the issues at hand. We have all seen the cruelty/abuse/and inhumanity of the World, whether we hear it from stories, observe it through images, or even up close to take care of innocent lives that have endured the shameful and horrific outcome of such cruelty – the constant reminders of the inhumanity that is plaguing our world and the silence that has permitted this cruelty to continue on.. and it is time to break the silence, save and protect lives, and open the eyes of the World to the actions that are causing more than just suffering and anguish, but also death to countless animals worldwide. BUT THE IMPACT TO BRING CRUELTY & INHUMANITY TO AN END IS WITH THE SUPPORT & PARTICIPATION OF INDIVIDUALS OF THE WORLD. We are hoping to encourage everyone across the World to support and participate in our efforts to fight animal cruelty, with strong , determined and powerful voices that the whole world will hear – to not only make the world orange for the voiceless, but also in support of the countless individuals who are dedicated and determined to save and protect life from cruelty and inhumanity, standing on the front lines and raising their paws daily. Without the participation and support of the World these living beings will continue to be exposed and be victimized by these horrific actions, #LetsGoOrange Worldwide! We hope you will SHARE and JOIN :) Thank You For Your Support.